You may have doubts about what your experience of swimming with dolphins will be like, that’s why today we bring you 5 things you should know before your interaction, knowing these you will feel more confident and won’t wait to do it. We recommend that during your next holidays in Cancun you consider saving half a day for swimming with dolphins. Those who have lived this experience say that the feeling is magical and believe that you will have the chance to be so close to such a special specie only a few times in your life. The dolphin habitats are significantly deep and large because dolphins are big and active and require large spaces, however, if you don’t know how to swim, don’t worry! You can live the experience. Spaces are designed in such a way that there’s always a platform on which you can stand perfectly. In addition, all visitors that participate in an interaction with dolphins must use a lifejacket without exception. Children over 1 meter tall can live the experience, as can people with a handicap. We believe that everybody should live this kind of interaction, that’s why we offer different options, so no one is excluded from this moment. For the dolphins’ safety and to keep their conditions at the highest standards, we recommend that anyone participating in an interaction, no matter which one, avoid the use jewelry and sunscreen. This will be a moment to be with dolphins, you won’t need anything other than your lifejacket and the excitement of living a unique experience. In comparison with other interaction programs with other kinds of animals, when you’ll be swimming with dolphins, you will be able to hug them, kiss them, touch them, play with them and also let them take you for a ride, as you can tell, you will be in extremely close contact with them. However, there’s no need to be afraid, even though they are very strong and big animals, they love to be in touch with humans and enjoy gestures of love and affection. You will discover their kindness and how they enjoy swimming with you. 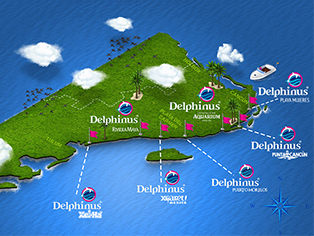 We know that you might want to bring your aquatic camera or cellphone with you to take some pictures during your interaction, however according to the policies of Delphinus, this is not possible. To preserve the dolphins’ safety as well as your own, it is not allowed to bring anything with you to the interaction. You will have access to lockers where you can keep your things safe. Besides, if you want to show your friends your experience, we have personnel that can take pictures or videos for you, so don’t worry, we have already thought of everything to make sure you enjoy your swim with dolphins. Now you’re ready to swim with dolphins! Plan your holidays in Cancun and book the interaction you like the most in advance to make sure that you will enjoy a unique and different experience during your holidays.